Back in 1977 Edward Miller wrote an article that still resonates today and provides insight into what I call “true believer” stocks like Tesla and Snap. To see how Miller’s analysis works, take a look at the graph below. The y-axis of the graph shows the estimated value of the company. This varies from investor to investor. The x-axis shows the number of shares investors are willing to hold. The number of shares outstanding (net of any held by index funds), N, is depicted by the vertical line. The key component of the graph is the downward sloping line. 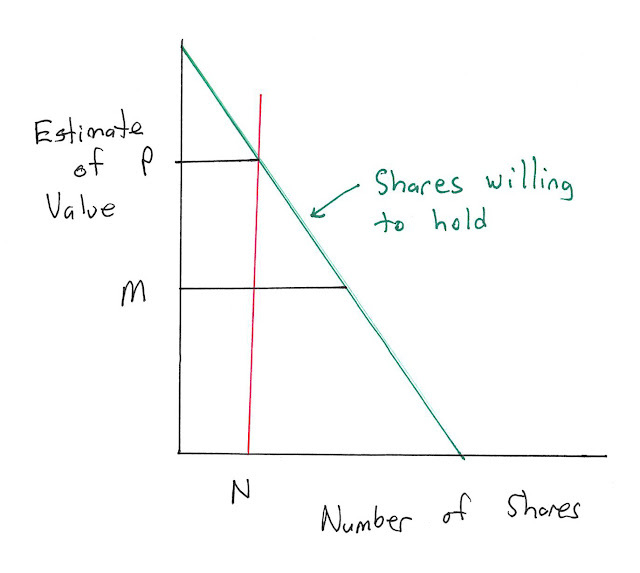 This shows how many shares investors are willing to hold as a function of price. As the price declines, more and more investors are willing to hold the stock. Market equilibrium exists when the N shares are held. The graph shows that this occurs at a price, P. This would be the market price. 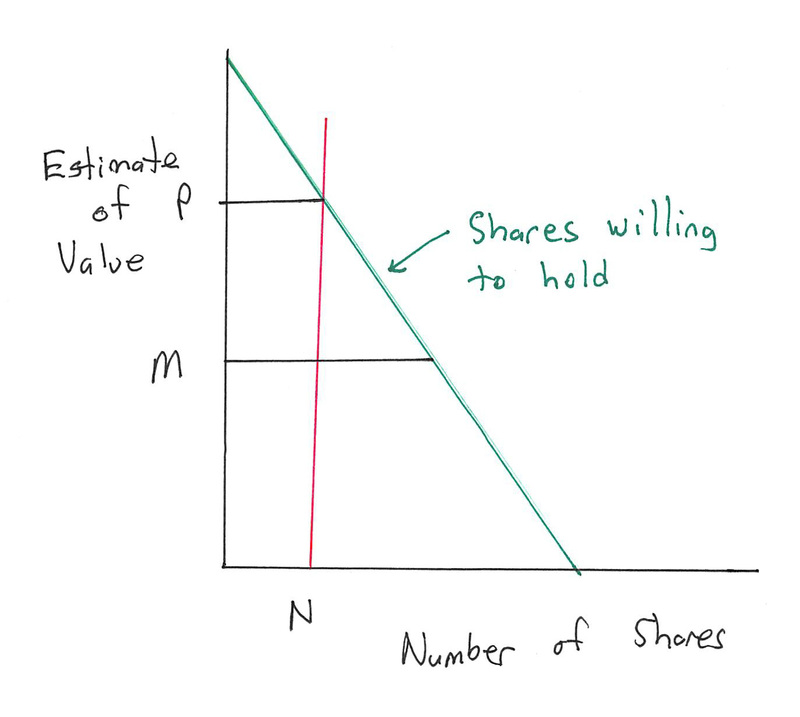 Notice that P is above valuation of the median investor, M. Miller’s key insight is that as long as the outstanding shares, N, are held by a relatively small number of “true believer” investors (small compared to all possible investors), the price will exceed the average assessment of value. In that sense, the company will be overpriced. By true believers, I mean investors who think that the subject company has growth options that will “disrupt business as usual” and “change the world.” The problem with such investors is that it is hard to know what they base their beliefs on, or, more importantly, what would cause them to abandon them. As I have stressed in earlier posts, beliefs regarding growth options can change overnight and if they do a death spiral can result. Without the ability to sell securities at high prices to true believers, the company becomes starved for cash, operations run into difficulty, key people leave, customers flee, etc. It is the story of eToys, My Space, and Groupon that has happened so many times.